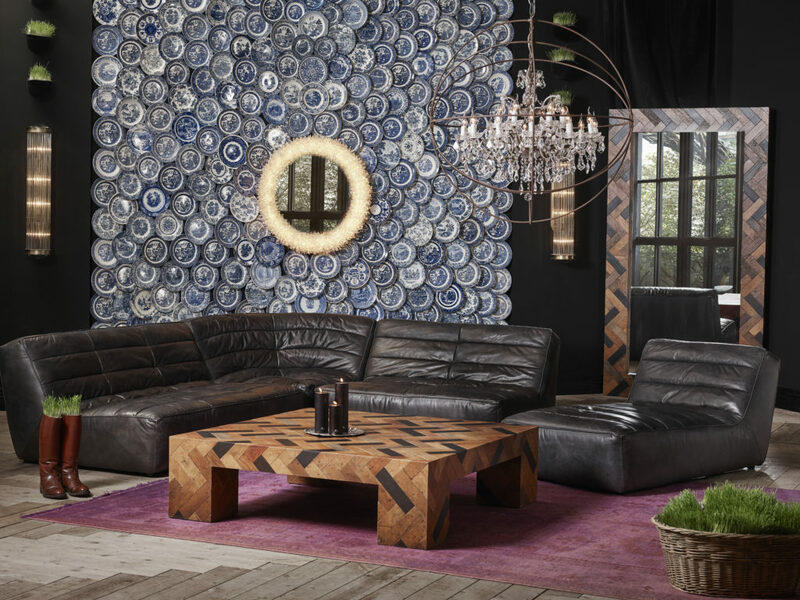 Driven by a desire to create experiences that touch people in a significant way, Timothy Oulton unveils its 2019 Collection, rooted in the idea that truly authentic materials and human-scaled design have the power to change how people feel. 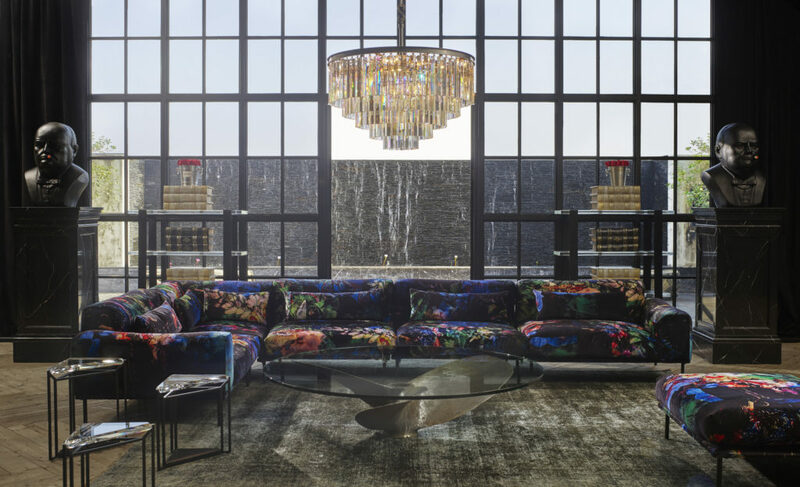 With a belief that great creativity is both enduring and yet perennially fresh, the 2019 collection sees Timothy Oulton bring its authentic handcraftsmanship approach to a gamut of new visceral and richly sensorial materials: selenite crystals, to printed velvets, sheepskin, deep hand-finished leather and reclaimed Edwardian parquetry. Standout pieces include the new Studio sofa, an addition to the Metro collection, which is Timothy Oulton’s expression of modern urban cool. This elegant framed sofa, available in both leather and fabric, is sleek and comfortable. Bringing a bold and vibrant splash of color to this geometric design is the new Acid Jungle fabric, a printed velvet that follows on from lasts seasons epic Faded and Degraded velvet range. Also new to Metro, is the smart and sophisticated City armchair, a leather swivel chair that can transform any room into a multifunctional space. And the rugged yet elegant new Milano chair, with its minimalist oak frame and luxuriously thick leather, is the perfect way to inject style into an urban space. Building on the ruggedly refined palette of the Loft range, Timothy Oulton introduces for the first time the Buck’dN Brok’n leather onto the Westminster Button sofa, its classic Chesterfield model. Previously featured on the iconic Saddle Chair, Buck’dN Brok’n is characterized by its deep scores and scratches that evoke an aged and storied life. The idea of a life well-lived is also embodied by the new Edwardian collection, featuring tables and mirrors fashioned from reclaimed parquetry oak and mahogany that originally formed the floors of Edwardian dancehalls in the U.K. 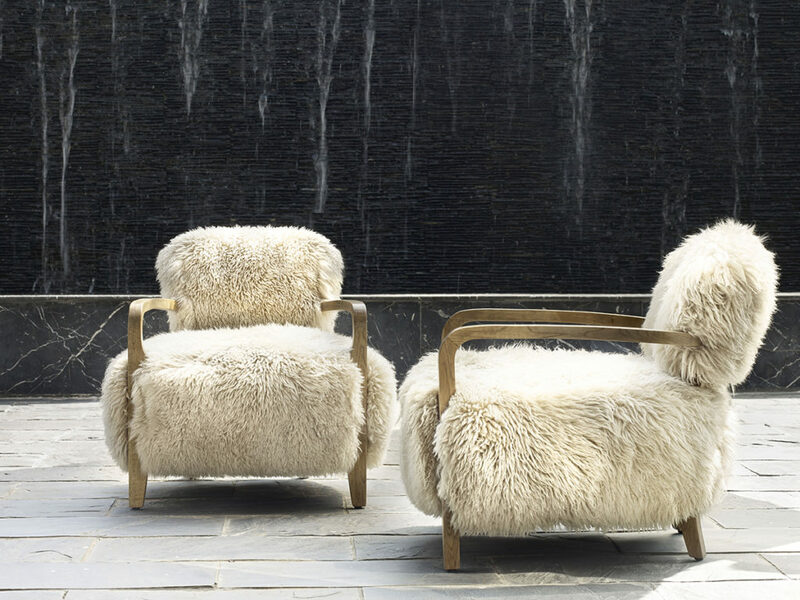 Extending the range of Timothy Oulton’s offerings, the collection changes gears with the wildly luxurious long-haired Yeti Sheepskin, newly available in black and brown. 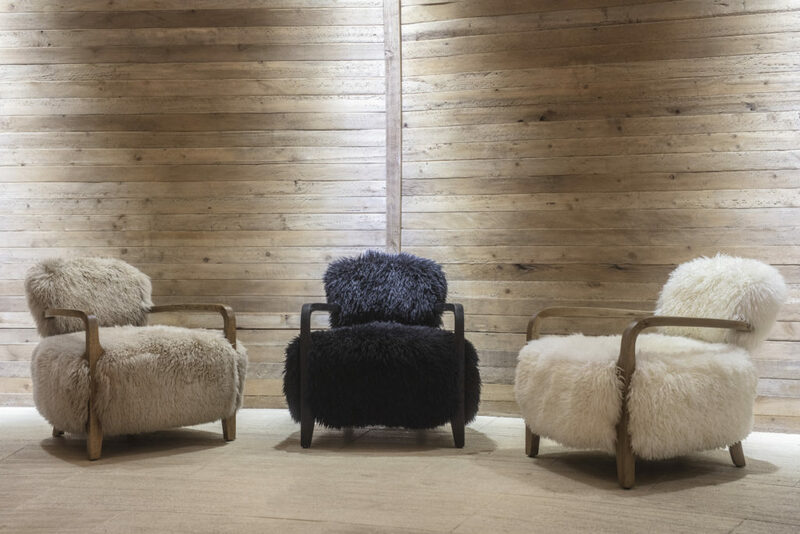 Yeti is showcased on the rustic new Cabin bench, inspired by the cozy feel of traditional forest cabins, and the Trio chair, a creative reinvention of a traditional slipper chair with generous proportions. Timothy Oulton’s innovative lighting range is also updated with renewed sparkle. Continuing last season’s foray into natural minerals and rocks is the Selenite collection of pendants and sconces. For the large Selenite pendant, more than 560 individual crystals are affixed by hand to create a dramatic stalactite-type effect. “Our new richly patterned velvet Acid Jungle is this vibrant, wild pattern that is very glamorous and dramatic, but also has this audacity about it. I also love the new Selenite lighting collection, because it tickles my current obsession with rocks and crystals. I like the idea of taking something very old—ancient even—and making something modern and unexpected with it, and there’s also that mystical element to rocks and crystals which I find fascinating,” Oulton said. Previous PostA New Space For R+BNext PostOnce Upon a Time Expands into U.S.